Photo by Ellie Rennie People's Production House attended an international seminar on community media in Seoul, Korea, December 17-18, 2008. The seminar, was organized by Korean community media centers Mediact and CAMF and sponsored by the Broadcasting-Telecommunication Commission. “This is an honor for People's Production House and our innovative integration of participatory media production and media policy advocacy,” PPH Interim Executive Director Don Rojas said. 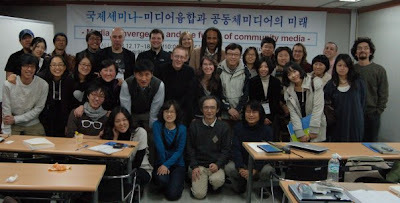 “We are excited to discuss our local work in an international context and to learn from the other participants.” Participants are traveling from Korea, the United States, Canada, Japan, United Kingdom, and Australia to discuss the role of community media and media activism in this time of media convergence. The other participants from the United States are Hye-Jung Park of the Funding Exchange, Joel Kelsey from Consumers Union, Louis Massiah from Scribe Video Center, and Sasha Costanza-Chock from the USC Annenberg School for Communication. For Korean participants, as for those from the US, this discussion takes place during a moment of great political transition, though the media activists in Korea are shifting to a less hospitable regime, while the incoming US President is more supportive of progressive media policies. MediAct emerged from the successful social movements in Korea that overthrew the military dictatorship. Over the years, it has provided fundamental infrastructure for participatory media democracy and secured government support for community radio, public access on cable and satellite, and local media centers. 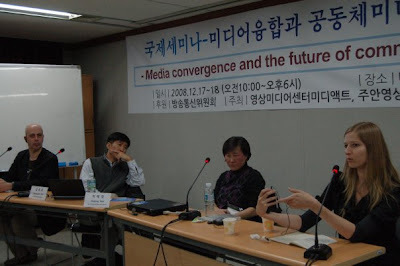 MediAct is part of a National Media Activist Network in Korea responding to two overlapping challenges. First, the new President is pushing neoliberal reforms, including an assault on public media and restrictions on Korea's advanced broadband infrastructure. The second challenge is the fast process of media convergence. The speed of technological and industrial developments have created a situation where the traditional regulatory framework has become obsolete. Commercial interests are placing immense pressure on community media as a public activity. People's Production House Co-Director Kat Aaron and Policy Director Joshua Breitbart will be presenting the organization's successful multimedia and media policy training program for youth and community media organizers. We will be looking to learn strategies for synthesizing various methods of media activism, integrating media production with social movements, and forming national alliances for promoting media policy reform. Together, all participants will also be discussing the challenges and opportunities for funding in this economic, political, and technological moment.